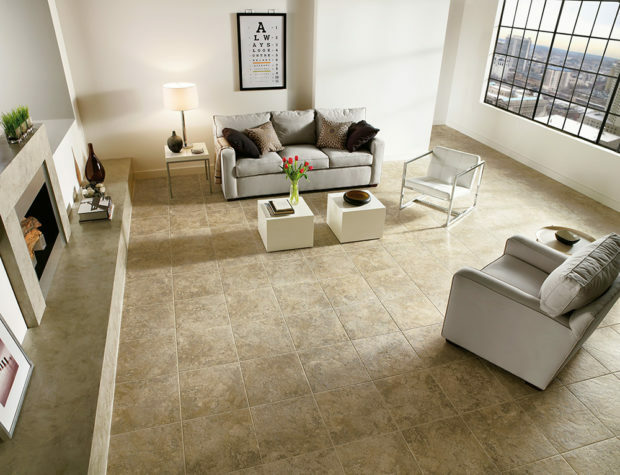 Luxury Vinyl Tile (LVT) – The Perfect Floor For Your Home? If you’re looking for a stylish and hard wearing alternative to wood, stone or ceramic flooring, take a look at LVT. 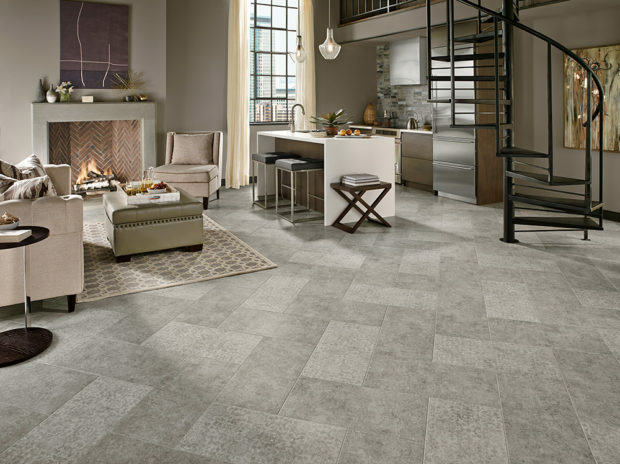 It’s an innovative vinyl flooring material that’s becoming increasingly popular for kitchens, bathrooms and living rooms. As a viable flooring solution for the modern home to cope with the tough demands of family life, LVT ticks all the boxes. It’s resilient to daily wear and tear, scratch resistant and waterproof. Crucially, LVT floor designs come in a myriad of different effects and incredibly realistic imitations of wood, stone or ceramic tiles. 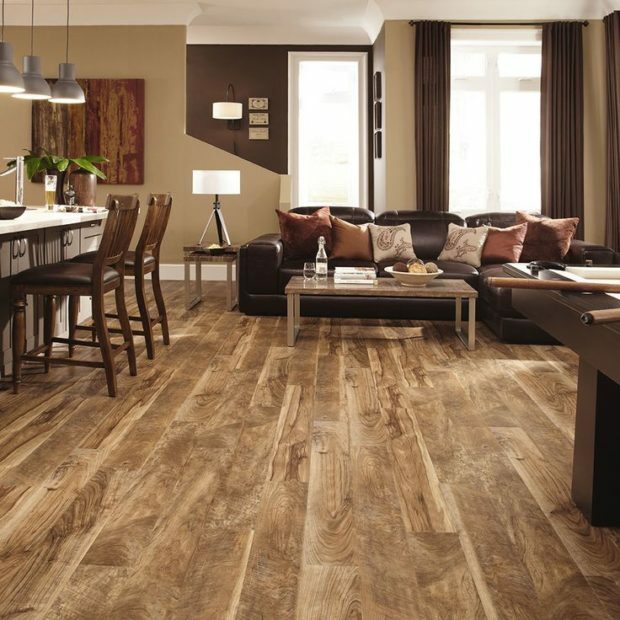 Wood effect tiles, for instance, are available in the shape and form of a plank of wood. There are different plank widths and lengths to suit every room as well as different types of wood, colours and grain patterns to give an overall authentic appearance. Stone and ceramic tile effect LVT are equally realistic, offering uniform sized tiles and a vast choice of colours and tiles that range from off-white ceramic tiles to dark grey slate tiles. 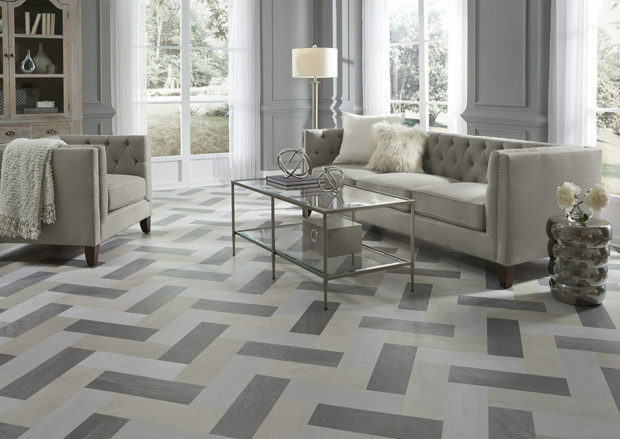 Well known LVT brands include Amtico and Karndean but there’s wealth of other LVT flooring manufacturers in the market place that are well worth checking out. Each LVT product is created and designed slightly differently but, broadly speaking, they consist of at least 5 thin layers that are compressed together to create a high quality surface that’s flexible yet durable and very easy to maintain. The transparent top layer provides a protective, scratch and stain resistant coating while the next layer determines the appearance of the tile. This design layer consists of a high definition photograph that gives an authentic representation of natural flooring – wood, stone or ceramic. The other layers are more structural, consisting of stabilising sheets of fibre glass, impact resistant core layers as well as moisture resistant layers to guard against tile warp and disfiguration. LVT installation is quick and easy. Choose between a glued floor commonly known as ‘dry back’ LVT, where the tiles are stuck onto the prepared subfloor, and a floated floor using an interlocking click system to create a seamless and gap free floor. Creating unique designs and patterns is easy. Whether you prefer to mimic the natural look of wooden floorboards, want to lay intricate parquet flooring patterns or ceramic floor designs, LVT planks or tiles can be laid in a huge variety of ways. With a vast range of designs on offer to provide a viable alternative to natural flooring materials, LVT will add warmth, charm and character to your home. LVT is harder wearing and generally a more practical solution, perfect for any room. LVT is scratch, dent and stain resistant, meaning it can cope beautifully with daily wear and tear. LVT is waterproof, perfect for wet areas in the home. LVT is highly tolerant to changes in humidity and temperature. LVT has sound reducing benefits, making it quiet to walk on. LVT is naturally warm to the touch, making it comfortable underfoot. LVT is thin yet durable and flexible, perfect for covering over an existing floor. LVT is compatible with all underfloor heating systems, with excellent results. LVT designs are extremely detailed and incredibly realistic in colour and texture. LVT is quick and easy to install either as a ‘dry back’ or floated floor. LVT is extremely low maintenance, only requiring a regular sweep and occasional mop. LVT is an ideal floor for pet owners, being anti-scratch, anti-slip and wipe clean. LVT is a great choice for allergy sufferers, being naturally hygienic and easy to clean.